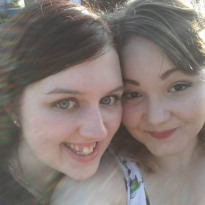 This review was first posted on Music, Books and TeaIt’s no secret I’m a huge fan of zombies. Allison Hewitt is Trapped has been on my radar ever since I first heard of it on Book Chick City. I was sucked in right from the very first page, and could barely stop reading it.Allow me to stay this: Allison Hewitt is the kind of person I would want to be in a zombie apocalypse. She is so real, and she’s not afraid to push the boundaries in order to try and survive. It was so great to read a book with such a kickass heroine who did stupid things and risks her life purely because she wants other people to survive. Does she think through all her actions? No. But was it easy to understand why she acted the way she did? Yes. Let’s face it, the world as Allison knows it has disappeared, she doesn’t know if her mother is alive or dead, she’s bound to make idiotic decisions! And I fully supported her decision on Zack, he was a bad’un and he fully deserved what he received.I loved the fact that the story is told through blog posts, and the fact that Allison seems to take advantage of the internet (the emergency military internet too!) a lot more than most people who are trying to survive a zombie apocalypse! And I thought it was brilliant how the post comments were included at the end of each chapter, a lot of them provided a lot of the book’s humour, and also made the book a little more realistic. It also made me want to have books written about each of the commenters, I wanted to know their fates too, and whether they were as lucky as Allison was.The romance in this book was interesting. For me, it didn’t really add a lot to the plot. Don’t get me wrong, I liked Collin as a character, but I could of done without him being a love interest and just being a badass ex-army guy who stops Allison from doing all those crazy and reckless things she sets out to do! Their romance didn’t take away from the plot (which was basically Allison killing lots of zombies with her axe), which I greatly appreciated. I loved the dynamic between Allison and Ted, one of the original survivors from the start of the book. 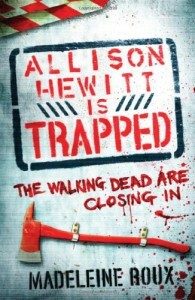 Their friendship really developed well, and when Renny was added into the mix, it got even better to read.Allison Hewitt is Trapped is a great introduction for someone who’s not entirely sure about zombies as a genre. It’s action packed, but not to the point of being ridiculous. The characterisation is spot on, and I’m a huge fan of Roux’s writing style. I can’t wait to dive into the next book in this series, Sadie Walker is Stranded.